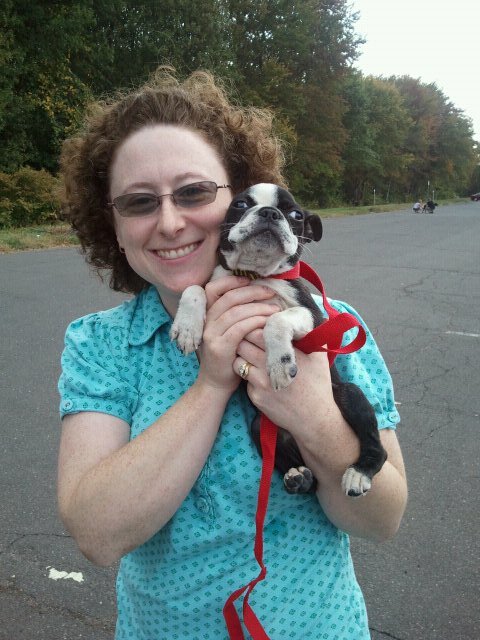 We found our Boston Terrier, Wally, listed on Petfinder.com in September 2010. His adoption was arranged through Carrie’s Canine Rescue of New Hampshire. His original Petfinder listing is still available on Petfinder.com. Originally named "Paulie," he and his five littermates had been turned over to a Tennessee rescue with their mother. Little did the rescue know, the puppies all had parvovirus—a virus that attacks the lining of the digestive system and causes dogs to be unable to absorb nutrients or liquids. Even though their foster mother gave them incredible intensive care, two of the six puppies did not make it. The remaining four puppies, Paulie (now our Wally), Lincoln, Bobble, Prudence, and their mother, Penny, were all spayed and neutered and placed for adoption on Petfinder. On September 25, 2010, Wally hitched a ride on the Last Chance Highway and made the long journey from Tennessee to his new home with us in Massachusetts. It was a match made in heaven! Wally is everything that his foster mother promised—a true lovebug, VERY loving and playful, just a really good boy! :) He's been with us almost a year now, and we couldn't imagine our lives without him. He makes every day just a little bit brighter and never fails to bring a smile to my face.